UreGrip 3360 is the next generation of direct-to-metal finishes. It offers outstanding durability and weathering characteristics. In addition, it’s formulated to resist mold and mildew. UreGrip 3360 may also be used as a topcoat with an inorganic zinc epoxy primer system for maximum corrosion protection in the most severe industrial environments. UreGrip 3360 is recommended for applications where high-gloss, low-VOC, increased production and long-term performance are desired. UreGrip 3360 DTM should lead the pack when it comes to a one coat solutions for fabricators, OEM’s and even maintenance painters looking for an solution that has a 2 hour pot life and 2-3 hour dry-to-handle times. This coating can displace an epoxy and polyurethane systems in one coat or may appeal to owners who would like to lower their shops VOC emission rates. The fast dry, high-gloss, low temp drying capability in one coat along with 2-4 hour dry to handle times. This technology allows for same day turn-arounds that could have taken 2-3 days with traditional systems. For cold weather application this coating can dramatically extend the painting season as lab testing has proven curing in sub-freezing conditions. – This material has a rapid tint capability (RTS) and can be tinted with commonly available 844 tints systems. Pricing: How does UreGrip 3360 DTM Stack Up? Contact US Coatings for pricing. UreGrip 3900 is a 2K, thin-film (1-2 mils/25-50µ DFT), fast dry, high solids, low VOC/HAP’s, high gloss polyurethane with mirror-like DOI (depth-of-image). This unique product allows for dry times to be customized by the applicator to meet the expectations of Original Equipment Manufacturers (OEM’s). The coating has high early hardness, excellent adhesion and resistance to impact, marring, abrasion, chemicals and staining. 3900 is recommended as a direct to metal (DTM) finish coating or as a finish over universal alkyds, epoxies, epoxy mastics, or properly prepared aged coatings. US Coatings understands that a fast drying, great looking finish signifies value in the eyes of our customers, and UG 3900 is the perfect solution to communicate product quality to their customers that lasts beyond the time of sale. UreGrip 3900 was designed to meet a variety of customer needs in the OEM and light industrial market. This product offers the aesthetics of an automotive finish combined with the performance of an industrial urethane. The ease of use and the physical performance exceeds any competitive coating in the high-solids, thin-film urethane market space today. The application qualities are appropriate where high DOI (depth of image) and improved throughput are desired, for example, excavation & agribusiness equipment, top-of-the-line light duty trailers, compressors, metal furniture & fixtures, crane fabricators, and job shops. Additional markets where clients are searching for a thin film topcoat with superior hiding and UV stable polyurethane finish the for completing of their custom work or large-scale assembly lines. The lower film build capability makes 3900 aggressive against thicker film polyurethanes. 3900 is also perfect for maintenance and touch-up of existing structures in moderately corrosive, high visibility areas. Dunn-Edwards is proud to now carry US Coatings, a leading manufacturer of high-performance and industrial coatings. US Coatings manufactures a complete line of light-, moderate and severe-duty industrial products, including single-component acrylic primers and topcoats, alkyd shop primers, two-component epoxies, urethane, and ultra-weatherable poly-siloxane products. If your project requires intumescent coatings, US Coatings also offers complete product solutions for interior and exterior fireproofing requirements. US Coatings custom tailors its products to fit the needs of clients across a wide variety of markets and — with the addition of this new product line — Dunn-Edwards now provides the most extensive range of industrial product solutions in the Southwest. Founded in 2000 in St. Louis, MO., US Coatings is an industry leader with connections spanning a vast number of specialty coatings markets, including marine, oil and gas, chemical, mining, water and waste-water treatment, manufacturing and commercial and architectural. Despite this success, US Coatings is committed to remaining nimble enough to take on any challenge, large or small. All US Coatings products are manufactured with the latest in coatings technology, providing exceptional toughness and durability, advanced corrosion resistance, enhanced chemical resistance and superior weatherability, as well as ease of application. Many US Coatings products meet or exceed SSPC coating specifications, such as SSPC – Coating Specification No. 36 which defines performance-based qualifications for Two Component Weatherable Aliphatic Polyurethane Topcoats. More than just purveyors of paint, US Coatings take collaborating with its customers seriously, providing superior service throughout the course of every job. With the support of US Coatings, Dunn-Edwards continues to focus on building relationships with customers to offer personalized attention to each client’s project — before, during and after — something the competition can’t match. For more information regarding US Coatings or any of its industrial coatings partners, please contact your local Dunn-Edwards sales representative. There’s a lot of talk about high solids coatings among industrial coatings professionals these days. But outside of the circle of experts (and sometimes even within it), the concept can be a little fuzzy. 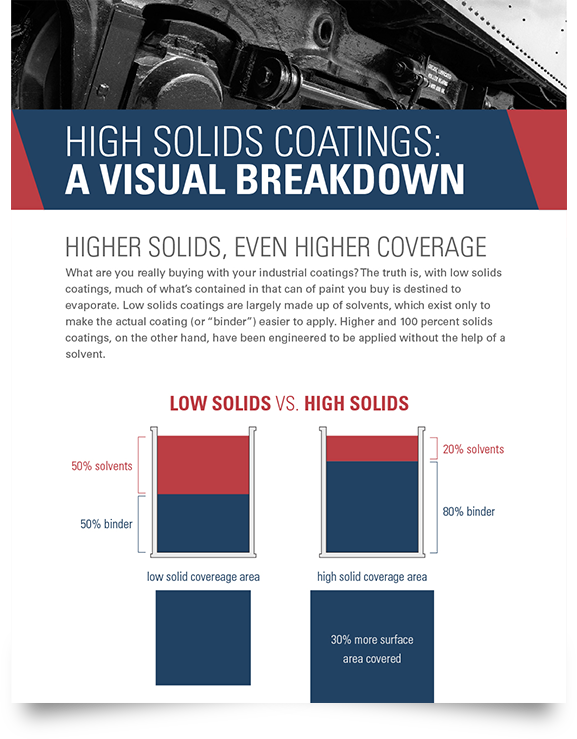 Here’s a visual breakdown that hopefully simplifies main principals at work when we refer to high, or even 100 percent, solids coatings. Click on the graphic to expand. US Coatings is excited to announce the addition of a new East Coast sales team to further expand our nationwide industrial coatings sales presence. Patriot Metal Finishing Systems, Inc. will now be carrying products from US Coatings. The Mooresville, North Carolina-based company specializes in finding metal finishing solutions for a broad customer base across a number of industries. The agreement with Patriot Metal Finishing comes shortly after the opening of a warehouse and industrial tint center in Los Angeles, California. Together, these agreements help to expand the nationwide distribution capabilities of US Coatings through trusted partnerships. US Coatings is a St. Louis, Missouri-based industrial coatings supplier. Founded in 2000, US Coatings creates products designed to serve a number of specialty markets and applications and prides itself on superior customer service throughout the course of the job. I’ve talked before about the importance of independent sales reps to our operation. I’ve argued that coatings sales reps have entered an age of under appreciation at large coatings companies. They’re often micromanaged, not allowed to unleash the full potential of their professional networks and their compensation often doesn’t represent the true value they bring to their companies. Higher commissions are one way that coatings manufacturers can address this issue. But that’s not the only strategy, and perhaps not even the most important one when it comes to assisting independent sales reps to be effective salespeople. After all, commissions occur less and less frequently the tougher it is to make the sale. First and foremost, coatings companies need to focus on supporting their reps however they can. Selling industrial coatings is a job that’s easier with a committed support team behind you. At US Coatings, we like to say that everyone in the company fills a sales support function. Sales, along with the quality of our products, are what keep us in business after all. So for us, it only makes sense to throw all of our resources behind the talented people that make sales happen. Another thing that makes selling easier? Having exactly what the customer wants. That’s simply beyond the capabilities of some massive coatings manufacturers. They have poured time and resources into getting juggernaut product lines moving full steam ahead, and tweaking them to meet a single customer’s needs is the equivalent of turning a freighter around at sea to recover a crewmember’s lost hat. It simply can’t be justified from the standpoint of time and revenue. More nimble coatings companies can still manage this, though. Custom coatings formulations are still a possibility for customers that would be forced to settle for an off-the-shelf solution with a global coatings giant. Take a customer that requires samples before making a bulk purchase, for example. Those might take a large manufacturer months to ship, if they’re willing to customize a product at all. But a coatings manufacturer who has a designated, small-batch specialist that’s used to working with a sales rep to address unique customer needs, these small orders can be churned out within a matter of days. This leads to happier customers that are more ready to make deals. When the sales and manufacturing arms of a company are collaborating to isolate product performance factors important to a buyer, to efficiently deliver on customer needs, and to do so quickly and reliably, then sales representatives are empowered by the full weight of the operation they belong to. Management, it goes without saying, is also a critical source of support. Sales reps need to feel that it’s okay to take their skills to the markets they’re most familiar with and to leverage the contacts they’ve generated over years of experience in sales. Too often, management assigns sales reps to arbitrary territories or product categories that don’t reflect their skills and experience. This is the level of support that independent coatings sales reps should expect from their organizations. It’s the best way to maximize both sales and the talents that each individual brings to his or her job. Unfortunately, it’s becoming more and more of a rarity for global coatings giants to provide it. And that may just end up benefiting the rest of us. In order to better serve Southern California and the surrounding Southwestern United States, US Coatings recently opened a warehouse and industrial tint center in Los Angeles, California. In addition to increased stocking and distribution capabilities, the industrial tint center will provide locally available color matching for US Coatings products. The facility will expand US Coatings’ presence and capabilities on the West Coast following agreements with new distributors and other customers in the area. “From a strategic and logistical standpoint, we’re really happy about this new facility and what it will allow us to do,” said US Coatings General Manager Mike Reed. “Southern California and the rest of the Southwestern United States are extremely important operational areas for us and this new facility will expand our capacity there. In addition to the warehouse, US Coatings has partnered with Premier Surfaces, Inc. to expand sales capabilities in the area. A network of independent salespeople with years of experience and a traditional focus on the Southwest will now be offering US Coatings products to their customers. Volatile organic compounds, or VOCs, are commonly emitted from everything from aerosol deodorants to household cleaning supplies. But because VOCs contribute to the buildup of ground-level ozone, VOC regulations exist in industries where they may be released in large enough quantities to constitute a substantial health risk. According to the EPA, ground-level ozone results from a reaction between oxides of nitrogen and sunlight. It can make breathing difficult and is associated with a host of respiratory issues. Residents of some large cities, such as Los Angeles or Beijing, will be familiar with the buildup of smog over the city skyline, especially during periods of sunny weather. VOCs are, in essence, a main ingredient of smog. 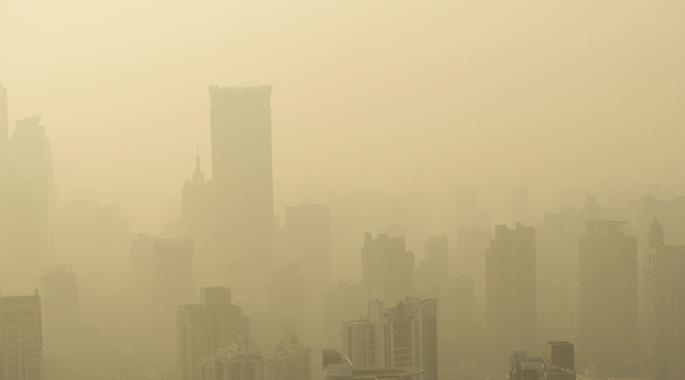 But whereas Los Angeles began to regulate emissions in the 1970s and the parts per million of ground-level ozone have fallen ever since, Beijing has only recently enacted emission controls and still sees exceptionally smoggy days. Though inventions like the catalytic converter have been instrumental in cutting pollution, so too have regulations on the output of VOCs in industrial settings. While VOC regulations may sometimes be a thorn in the side of high-output facilities, they’re nothing compared to the health effects that can result from heavy exposure to ground-level ozone from VOCs. Coatings manufacturers are limited in the number of VOCs they may put in their coatings by the EPA’s Architectural Coating Rule for Volatile Organic Compounds. Enacted in 1998, this subset of the earlier Clean Air Act sets nationwide rules for the manufacture, labeling and packaging of coatings intended for use on any stationary structure. This category includes what are typically thought of as industrial coatings. Additionally, nearly every industry has its own regulations controlling for VOC emissions. State regulations must meet what the EPA calls Reasonably Available Control Technology (RACT), or the lowest VOC emission levels that can be achieved given technological and economic considerations. Some states and counties, however, go even further. States like Pennsylvania and California have enacted VOC regulations that are far tougher than the EPA’s. VOC regulations don’t have to be the limiting factor in production for manufacturers. OEM and other operations using large amounts of industrial coatings have low-VOC options. These can help keep manufacturers running at full bore, while allowing manufacturers to continue doing business as usual. We’ve written on this blog before about 100% solids coatings. These are coatings which contain no solvents, and hence no VOCs. While it is true that these coatings tend to come with a higher sticker price than a similar coating containing VOCs, they also tend to cover a much greater surface area. In many cases, this can make the price difference a relative wash.
Water-based coatings are another option for manufacturing operations to reduce their VOC output. While these coatings may have had longer curing times in the past, newer, hybrid formulations and other methods of forced curing have largely made this issue irrelevant. These products can also help to remove the need to artificially slow production in order to stay beneath VOC emission limits. If you’re interested in discussing low or zero VOC coatings further, we’d love to talk. You can get in touch with us here. Note: This is the fourth of a series of posts covering the definition, development and properties of flow efficiency coatings. Click the button at the bottom of this post to download the full PDF. Our series on flow coatings has hopefully been building the case that, when the advantages of flow efficiency coatings are combined with the corrosion-resistant properties of 100 solids coatings, they more than justify the expenditure. Flow coatings have been shown to reduce both capital and operating expenditures over the long term. A 2000 study demonstrated that flow coatings were capable of cutting friction coefficients by 50 percent in carbon steel pipes. Another study by Rafael Zamorano shows that a 1,200 km pipeline owned by GasAtacama returned substantial savings by using internal flow coatings. The company reported saving $2.4 million in fuel for compressor stations alone. When this figure was added to reductions in capital and operating costs, savings exceeded $20 million. Shell Global Solutions was recently able to demonstrate cost savings of 5% on a 250 km stretch of pipeline because flow efficiency coatings allowed them to move to a smaller diameter pipe. France’s Institut Francais du Petrole realized cost savings of 7-14% in lightly corroded pipe and 15-25% in the case of highly corroded pipe. The sticker shock that accompanies these 100 percent solids has discouraged owners from investing in them, despite the returns on investment they have been found to deliver. On average, 100 percent solids run around twice the cost of the same amount of 50 percent solids. Fortunately, these higher solid coatings end up covering about twice the surface area of the lower solid option. This turns the price difference into a relative wash. Once the added benefits of a 100 percent solid are factored in—zero VOCs, no loss factors since the components aren’t mixed until the time of the application and added corrosion protection—then 100 percent solids bring far more to the table than their apparently lower-priced counterparts. The debate over the cost-effectiveness of flow efficiency coatings has raged for some time. 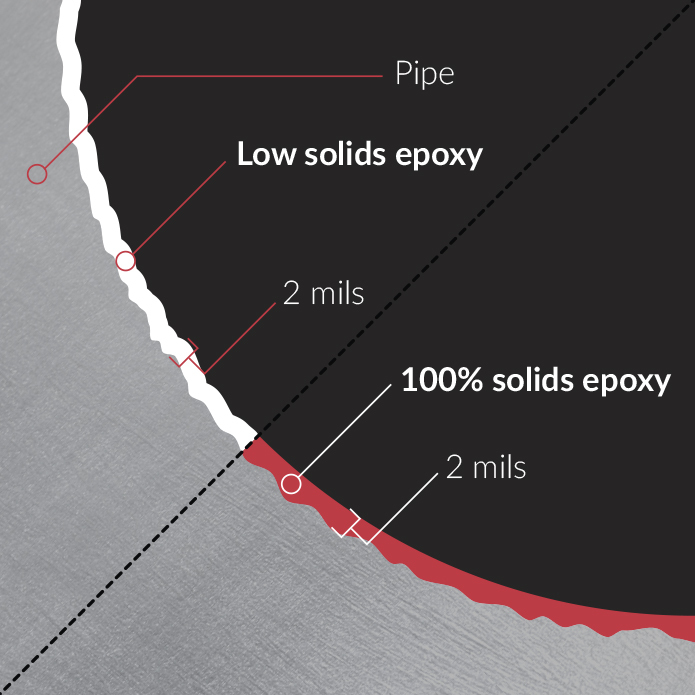 But developments in 100 percent solids coatings lead to added benefits as internal pipe coatings that tip the balance in favor of these coatings. Unlike their forerunners, these coatings allow for added mil thickness when corrosion protection is a concern. In addition to increasing hydraulic efficiency and preventing buildup, internal pipeline coatings are now able to provide effective corrosion protection. And given the rise of new forms of oil and gas extraction, corrosive materials will soon be flowing through a lot more pipeline. Note: This is the third of a series of posts covering the definition, development and properties of flow efficiency coatings. Click the button at the bottom of this post to download the full PDF. For years, regulatory agencies have focused on the issue of external pipeline corrosion, sometimes neglecting or leaving aside the question of internal corrosion. 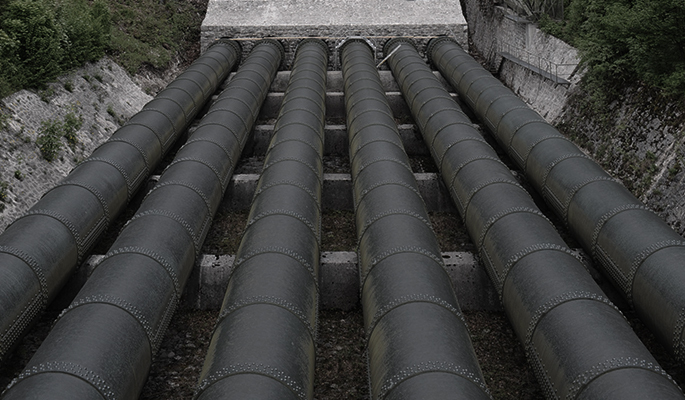 Not surprisingly given the harsh environments many oil and gas pipelines operate in, most of the energy has been allocated to preventing corrosion occurring on the outside of pipelines. Only recently have pipeline owners begun to focus serious attention on problems (and missed opportunities) stemming from internal buildup and corrosion. As documented cases of internal corrosion pile up, the argument for flow efficiency coatings being a sound investment is strengthened. The proliferation of hydraulic fracturing and similar methods of oil and gas extraction only furthers this conclusion. For an explanation of why these methods introduce more corrosive elements than traditional extraction methods, see this post on tank linings in the age of hydraulic fracturing. Traditionally, internal pipeline coatings have been divided into two groups: those aimed at improving hydraulic efficiency and those aimed at controlling corrosion. Flow coatings, typically applied at a thickness of around 2 mils, were not sufficiently thick to be considered corrosion resistant linings, which are typically around 5 mils thick. But 100 percent solids can help to close this gap between traditional flow coatings and corrosion resistant ones. Unlike with water or solvent-based coatings, 100 percent solids allow for the addition of mil thickness until the desired level is reached. There is no danger of water or solvents becoming trapped within the film build because there is no water or solvent. This feature allows 100 percent solids to provide added value as internal pipeline coatings, since they serve both to increase hydraulic efficiency and to fight the sort of corrosion that can lead to disastrous financial and environmental setbacks. As mentioned in an earlier post, increased attention is being paid to flow rate and instances of internal corrosion. According to a study conducted by the API, corrosion was still the leading cause of leaks by 2012. There were 204 total incidents of internal corrosion between 1999 and 2012. Of these incidents, 31 occurred in portions of pipeline that had intermittent flow and seven in portions that had no flow. In these instances of low to no flow, water is more likely to collect against the side of the pipe, creating the conditions necessary for corrosion to occur. The report concludes that, while instances of external corrosion continue to be the leading cause of incidents along pipelines, much more has been done to address these external issues. As a result, their rate of occurrence is dropping far faster than instances of internal corrosion. When the stakes include the costs of a damaged asset, time lost with the asset out of service, leaked material and environmental liabilities, then it stands to reason that internal anti-corrosion coatings justify the initial cost output. If they also combine flow-efficiency properties, their value is all the more certain. Flow efficiency coatings are known for reducing pipeline pumping costs. Now they’re also providing corrosion control.